This curved executive desk makes a prominent centerpiece for any home or professional office. Its unique top is finished with beautiful white ash and is curved both on the visitor's side and above the kneehole. Seven drawers make storage and filing convenient and easy. Elegant paneling detail on the front and sides of this desk give it a professional feel that will meld excellently into any traditional office scheme. The Essex Curved Executive Desk with 7 Drawers by Aspenhome at Walker's Furniture in the Spokane, Kennewick, Tri-Cities, Wenatchee, Coeur D’Alene, Yakima, Walla Walla, Umatilla, Moses Lake area. Product availability may vary. Contact us for the most current availability on this product. The Essex Collection is the optimal office set for the traditional home. It features an array of pieces to perfectly fit your personal preferences. Multiple desk options all offer large work spaces and pieces like bookshelves provide accent, storage, and display. The collection also includes a classic swivel side chair with a smooth, slatted back and a padded leather seat. 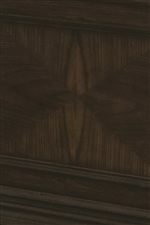 Traditional molding, paneling, and fittings add a timeless, universal feel to this collection which is reflected in its molasses-finished white oak veneers. 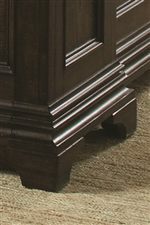 The Essex collection is a great option if you are looking for Traditional furniture in the Spokane, Kennewick, Tri-Cities, Wenatchee, Coeur D’Alene, Yakima, Walla Walla, Umatilla, Moses Lake area. 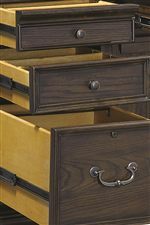 Browse other items in the Essex collection from Walker's Furniture in the Spokane, Kennewick, Tri-Cities, Wenatchee, Coeur D’Alene, Yakima, Walla Walla, Umatilla, Moses Lake area.